*Coupons and discounts not accepted during special events, please call 815-385-3644 to confirm schedule. Wear comfortable shoes. 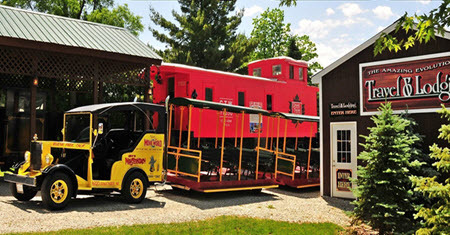 There is so much to see and do at The Volo Auto Museum, there really is no set amount of time spent that will suit every visitor, it can range from 1 1/2 hours to 5 hours. We suggest planning the whole day if you are interested in a “deep dive” into all of our exhibits. However, you do not need much time at all to be inspired by our brand of history — a couple of well-placed hours are all it takes for a great visit. Due to repairs and maintenance some items listed on the website may not be available for viewing. If there is an item you are specifically interested in seeing, please phone first to confirm its status. Learn about the museum on a 30 minute guided tour. *Please note that operation of the ride is dependent on factors such as weather, attendance and unforeseen mechanical issues. If you are coming for the Train Tour, please call that day. Easy Travel from Chicago with Metra.